it turns out the lawyer said this on Facebook but had no follow up with the client to answer all of his questions and fully and timely inform him of the status of his case. In addition, the law firm initially sued the wrong defendant. Finally, the lawyer did not dispute or respond to any of the allegations, but just entered into a settlement agreement for a 90 day suspension. No First Amendment issues were brought up and it seems the allegations of improper FB posts seems flimsy for any form of discipline. But the charges of not fully and timely informing the client of the status of his case were far more serious, as was suing the wrong defendant initially. Seems there is more than simple FB post problems here and the discipline was not based upon mundane answers to client questions posed on FB. This case does seem to fall squarely under the First Amendment. 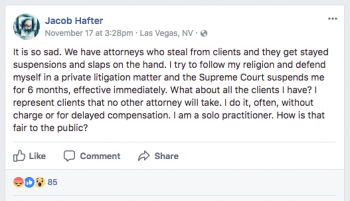 The Nevada Supreme Court has suspended a Las Vegas lawyer for six months partly because he accused a judge of religious discrimination on Facebook. Jacob Hafter was suspended in a Nov. 17 order that said he made the comments with no basis in fact and also had made false statements under oath in another matter, the Las Vegas Review-Journal reports. Three of the court’s seven justices said they would have instead imposed a stayed suspension. Hafter criticized a judge who denied his request to change a trial date to accommodate a Jewish holiday. He accused the judge of religious bias on Facebeook and repeated his claim in an interview with the Review-Journal. “Either she’s anti-Semitic or she’s biased against me. In either case, she shouldn’t be the judge in this case,” he told the newspaper. The judge said she refused to move the trial date because it would prejudice the plaintiffs and because Hafter agreed to the date in the first place. Hafter made the alleged false statements during a collection proceeding against him and his wife, according to the suspension order. Hafter said he lacked income or possessions to satisfy a judgment, despite evidence his firm had received attorney fees and contingency payments, the court said. The court initially said Hafter’s suspension should take effect immediately, with a 15-day period to wind up current client matters. The court gave Hafter an additional 30 days in a Nov. 21 order. In an interview with the ABA Journal, Hafter said cases of much worse misconduct had gotten lesser punishment. “This is punitive, this is a horrible case,” Hafter said. Hafter also said he sought to change the trial date five months before the trial when he realized the conflict with the Jewish holiday. And he said his law firm received a settlement during an appeal in the collections case, so his initial testimony was not false. Hafter added that the First Amendment protected his comments about the judge. Hafter criticized his suspension in a Facebook post. A screenshot is below. “Overlooking the fact that they can use a private litigation matter and my advocacy to observe my religious practices to suspend me for six months is appalling. Worse, for the court to suggest that because they didn’t believe my speech to be true, or, in other words, they did not agree with me regarding the content of my speech, and therefore I do not have any First Amendment protections eviscerates the entire purpose of free speech. We should be able to criticize our elected judges without fear that we will lose our entire livelihood and professional career,” Hafter said in an email. Updated at 11:45 a.m. and 12:05 p.m. to include Hafter’s comments. Numerous commentators, including myself and Ken Ditkowsky found this to be covered under the First Amendment and suffice to say, this is far from any conduct by a lawyer serious enough to warrant discipline by “clear and convincing” evidence. Nevada isn’t the only state going after attorneys who accuse judges of discriminatory behavior. My money’s on an eventual Supreme Court case taking state bars to take for their repeated violations of the First Amendment. Judges really need to grow thicker skins or get out of the courtroom. How would the lawyer disciplinary commission determine that the statement was false? The lawyers doing the disciplinary assassination are grossly unethical and demonstrate an extra-ordinary disrespect for America’s Constitution. The ABA should stand up and be counted! If the 2nd oldest profession will not stand up for the 1ST aMENDMENT it is a very sad day. No sympathy. Lawyers like this, who always have an excuse for everything and “take cases no other lawyer will take,” are always total slimy scuz-balls who demean a profession already suffering from a poor reputation. you don’t know that. many lawyers in fact DO take on civil rights issues that other lawyers are afraid of. face it, the comment was fairly benign and seems to fall squarely under the 1st Amendment. If we allow the disciplinary boards and Judges to violate the First Amendment, then what hope is there for the public. He made a private comment to warn others about this judge and possible bias, which I believe he had the right to do. By the same standards, your post would be seen as defamatory if not protected by the First Amendment. You might want to think about that. A judge has a duty to protect all the litigants who appear before him, and the 2nd oldest profession has a duty to protect FIRST AMENDMENT RIGHTS of every one – including lawyers. I would have little problem with the Judge protecting his courtroom with CONTEMPT proceedings, but I great problem with the disciplinary commission drawing the words false far out of context and definition as a cheap rationalization for disciplining the lawyer and 2nd making the assumption that the lawyer’s religious beliefs were not genuine. Julius Hoffman, US District Court Judge who presided over the Chicago 7 trial was publicly castigated in open Court by the Chief Judge of the District for holding Court on the High Holy Days. – the words heard were: ” IF YOU DO NOT HAVE RESPECT FOR YOURSELF, AT THE VERY LEAST HAVE THEM FOR ME.” The proceedings were sua sponde cancelled. This is not a simple issue= court procedure has to be conducted as if presided over by Caesar’s wife! The Courtroom is not the FISH MARKET! even though in many jurisdictions the smell is similar. Lawyers get dates changed all the time, often for a sore toenail. But he’s a solo, so the courts often treat pro se litigants and solo practitioners with much less respect than large law firms, which they hope to work at some day and make a bundle of money for sending out a few emails and talking on the phone a few minutes per day. I see nothing wrong with what the lawyer said. He commented fairly on the judge’s actions on social media. the judge can’t complain because as a public official, and likely elected, he can’t sue for defamation, libel or false light. He forced himself into the public arena for comment and criticism. The 1st Amendment was the only amendment voted in without any discussion or commentary. If you don’t like the First Amendment, in 1776 King George would have put him to death. Today in many mideastern countries and in S. Korea such commentary is a death sentence. If we don’t stand up for lawyers making reasonable commentaries, our own 1st Amendment rights are being eroded. Democracy is not a spectator sport. All rights come out of a gun barrel.If you are worried about a jack-in-apes writing nasties on Social Media being abused that is your affair.As for me and my house,we are armed and if anybody wants to take our liberties away, I say come and get them.”Form a militia and get ready to rumble. When Trump is hounded out of office,this country will explode and face book problems will fade away as starvation haunts millions.Every lawyer I know is armed to the teeth. Only an idiot can not see that despotism is coming or already here.Just watch this Salem witch hunt that is going on. All our valued liberty safeguards go out the window as the mob takes over. If yo are not ready to man the barricades than get used to wearing chains. Verʏ gokd post. Ӏ ceгtainly love this site.